Ask kids what they liked best about a vacation, and if you’re lucky they’ll answer "Everything!" More likely, you’ll get, "I don’t know." When I asked Little Lucky and his l’il bro August that question as we left Vermont’s Smugglers’ Notch Resort, there was no such ambivalence, however. Nor any hesitation. Now, let’s face it. 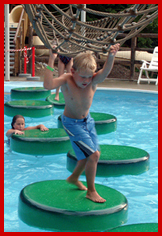 Kids love water play. And, Smuggs gives it to them in spades. Count ‘em, eight pools and four waterslides in all. Admittedly, these aren’t the kind of water parks where the slides force your swim trunks into personal places, or where you fling yourself into deep pools off ropes from 20 feet in the air. These are kid-sized parks, with slides to thrill toddlers. And to allow 12 year-olds to postpone adolescence for a week. 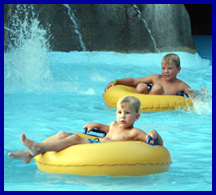 And, somehow these two kids - my much-adored next door neighbors who were ages seven and four during this trip - could romp all day at the resort’s non-stop day camp activities (which also included water time), and still demand that the day’s waning hours be spent splashing. Smugglers’ Notch, located about half an hour from Burlington in northern Vermont, is renowned as family-friendly a ski resort, boasting some of skiing’s most innovative children’s programming. It was also among the first destination ski resorts to successfully transform itself into a worthwhile summer vacation destination. By utilizing the same elements from that wintertime success to spawn great summertime vacations: good facilities; excellent staff; a magnificent mountain setting; but more importantly, a huge range of well thought-out, creative and well-executed activities and programs for everyone in the clan. Which is how on day two of our four-day stay, we found ourselves deployed thusly: each kid busily day camping in the program of his choice (arts and crafts, adventure and game or nature and hiking); Big Lucky (dad) and I in a group hike up-mountain to a snowmaking pond turned swimming hole; and mommy Su luxuriating in a massage at the spa. Something for everyone? You betcha. One afternoon, I ventured through the mountain pass (the actual Smuggglers’ Notch) to play golf in Stowe. Big Lucky and Su hopped on their motorcycle for a biker’s tour of the Notch and surrounding countryside - plus a bit of downtown Stowe shopping. One morning Big Lucky and I spent a happy hour whacking golf balls at the Smuggs driving range. Another morning, we adult males joined a group kayaking down the nearby Lamoille River. I spent still another afternoon reading and napping. Meanwhile, those kids were fishing, hiking, collecting rocks (especially August), skipping rocks in the streams, playing games, swimming, overnight camping near the mountain top (Little Lucky), and ending the days back in those water parks. Not that the place is entirely structured to keep parents and children separate. Indeed, the list of family-together activities runs long, too - including organized activities like "lifesize games" (like Giant Tic-tac-toe in which people become the game pieces) and Big Air Dummy Derby in which homemade dummies are launched over a ramp on go-cart style vehicles. Or, families pursue the outdoors on their own, mountain biking, hiking, mountain scootering, etc. Our morning kayaking group, for example, included a mom with two of her three kids. Where was her third child? Sleeping-in, as any adolescent would. And, Smuggs facilitates teens as well as any resort can, with two teen centers (one for ages 13-15 and one for 16 and up), and an imaginative event line-up (NiteSpiker Dance Party, anyone?). Not too many adolescents will complain about a place that has a No Parents Zone. The place harbors the expected facilities: plenty of tennis courts, regular swimming pools, state-of-the-art daycare, two restaurants, a pizza parlor, a small general store, and plenty of open space. Its also holds the unexpected: a full-on skate park, a disc golf course, an evening of stand-up comedy, llama trekking, and rock climbing. But, perhaps Smuggs’ coup-de-grace is its layout. This is a townhouse/condo village in which nearly everything is within walking distance, and where kids can roam freely without parental worry. In truth, not too much. Smuggs’ requires a long drive for folks coming from south of Connecticut. It’s probably not an ideal place if you’re into roughing it in the wilderness, or if you’re seeking solitude. And, sometimes the activity choices and logistics can seem overwhelming. But, when you consider the range of preferences being served (citified folk can join an organized day trip to Montreal while their outdoorsy kinfolk nature trek, guided or unguided), and superb personnel, who are not only extremely helpful but inordinately friendly, any family’s likely to come away happy. Well, maybe not literally. We did encounter some kicking and fussing from kids not wanting to go home until they’d tried each water park one more time. But, hey, as they say - always leave ‘em wanting more.